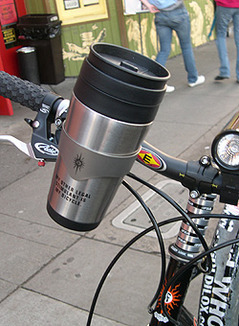 While we’re on bike-related gadgets, let’s mention the bike mug. it’s not the most complex piece of human engineering we’ve ever covered in these pages, but for those of you who like cycling and like drinking hot beverages this could be the bike mug for you. No it doesn’t pipe warm tea into your mouth, it is an insulated cup that attaches to your handlebars. During pauses in your cycle, you can pick it up, take a sip or two, and enjoy a relaxing drink while you wait at the traffic lights in front of roaring motorists. Holding 16oz of tea or coffee, it has a slide-button lid you can operate with one hand. Apparently, it really pisses motorists off: “Every time I lifted the cup from its handlebar-holder while waiting at traffic lights, I swear I could hear the drivers behind muttering in disapproval.” writes Helen Pidd in the Guardian who, err road-tested it. While the idea is nice it seems that the attachment and the lid are a bit shoddy, breaking loose after a few trips and spilling liquid when taking speedbumps. This seems like a good idea, good price so worth giving it a whirl. I will bare in mind that it may not be very long lasting but i’ll enjoy annoying the motorists.